Want to boost the curb appeal of your abode? Give your front door a splash of color. Afterall, your entry is the first thing family, friends and neighbors see before stepping into your home. 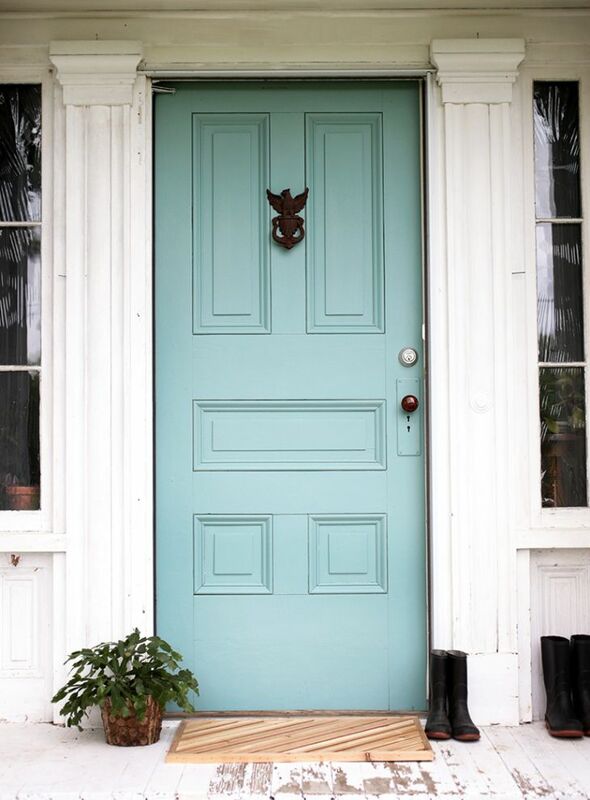 A fresh coat of paint is an easy and affordable way to enliven a drab door. And don’t forget to accessorize. Amp up the personality with a custom doormat or lanterns. Celebrate the season with festive decorations, like wreaths and blooms. Need some inspiration? Take a peek at these eye-catching entrances. From cheerful yellow to lush green, these front door paint jobs are guaranteed to drum up some awesome ideas for your domicile. 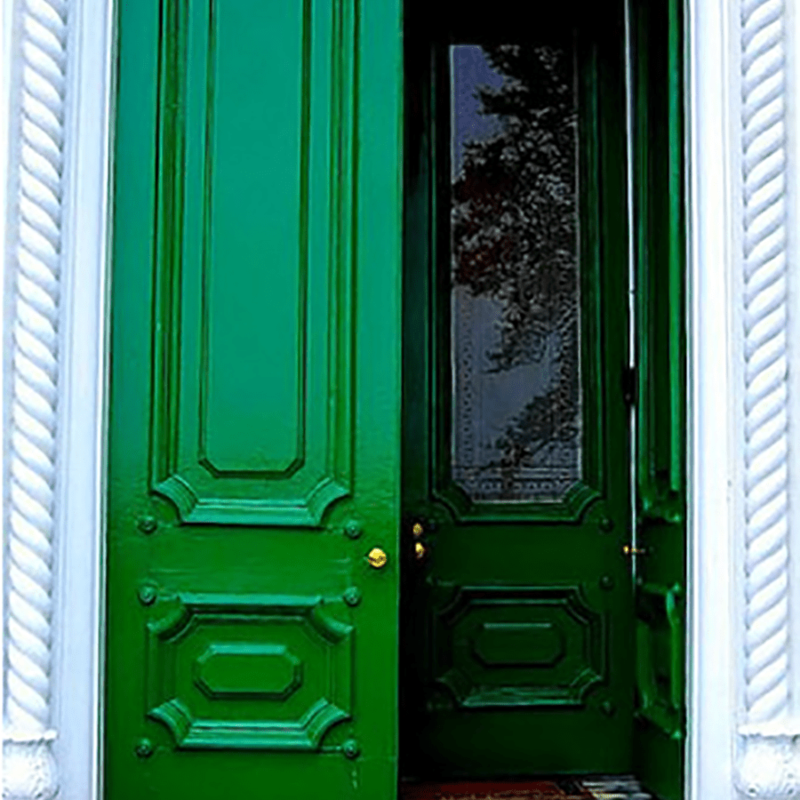 Green is linked to luck, prosperity, and health, which perhaps explains why it’s such a desirable shade for front doors. Added bonus: This verdant shade, as seen on High Street Market blog, is sure to make your neighbors green with envy. We’re mesmerized by the vintage charm of this front porch, with its intricately inlaid panels and weathered white wood. A few coats of spa blue paint and a DIY wooden doormat from The Merry Thought give it a fresh, contemporary feel without taking away from the antique allure. The petal pink raised panel door of this Palm Desert domicile, designed by Moises Esquenazi and captured by Studio DIY, evokes the retro glamour of this Hollywood vacation destination in its hay day. The silver fixtures mounted lanterns, and agave plants enhance the dreamy, desert esthetic. Give your guests a taste, err view, of the Mediterranean with this Cycladic color, as striking as the sea itself. Multi-colored path tiles from London Mosaic (installation by Anewgarden), earthy bricks and white stucco round out this striking entry. Not only does red express passion and energy but in feng shui, it’s considered a welcoming color. Plus, it’s prime for holiday decorating. As we enter winter, take a cue from Your Space By Design and spread seasonal cheer with a festive wreath and some poinsettias. Come Valentine's Day, a sweet garland is sure to send hearts aflutter. The bright yellow paint Young House Love chose reminds of pure sunshine. How could you not be happy with such a cheerful entry? A welcome mat and a pair of potted plants finish the inviting vibe. Blue (connected to the water element in feng shui) and white is a classic seaside color palette. Sustain My Craft Habit’s cute brick cottage gets a major dose of coastal charm courtesy of a harbor blue, semi-gloss door and farmhouse white trim (both paints from Americana Decor Curb Appeal). Give guests a bold and inviting first impression with lapis, like this entry snapped by Peony Lim. Whitewashed brick is the perfect complement, taking the back seat and allowing the vibrant shade to really shine. A golden mail slot and lion-head door knocker exude the glamour of an era gone by. Cool gray-blues connote calmness, serenity, and relaxation—a signal that your home is a respite from the chaos of the outside world. While the detailed archway and perfectly trimmed triangular topiaries add a touch of old-world European flair. 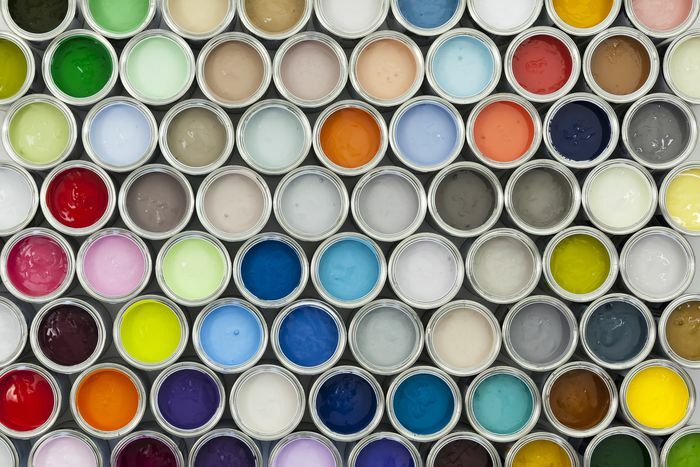 15 Bedroom Paint Colors That Please Your "Palette"